I continue my journey through my photo folders, this time in no particular order. The “million pieces” quilts always impress me, and here are a couple. Above is “9 Patch Tastic” by Jean Perce, (with a Jacqueline de Jong inspired quilt in the background). This one is called Jardin des Fleurs, and is made by Eileen Swart. It is made of lots of different Liberty fabrics. Love the praerie points and the pearls. This Courthouse steps quilt made by Mary Mayne has 1700 pieces in it, and are not foundation sewn. One block is different from the rest. I liked the calming colours, and the button centres. This storm at sea quilt was made by Breege Watson from Ireland. Blue greens are my favourites. Here is an other take on the storm at sea pattern. 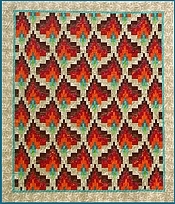 The quilt is called “Fish at Sea”, and was made by Pam Stanier, who had it longarm quilted at Quilters’ Trading Post. It won a Judges Choice award in the Two person category. 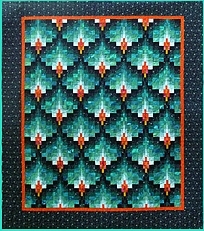 “Dragonfly in Teal” is the title of the quilt above, made by Daphne Barker. Lovely colours and quilting. Here are some colours for you. The quilt is titled “Wally”, and was made by Doritha Smith. The fabrics are African wax prints, combined with a hand dyed background fabric. It is machine pieced, but quilted by hand, and won a Judges Choice in the Traditional category. I liked this quilt because of the tonal fabrics, and the simplicity of the design. It was made by Rosemary Payne for her grandson, and is meant to be used. The fabrics are Kaffe Fasset shot cottons. This one is also made of shot cottons, and the colours are practically glowing. 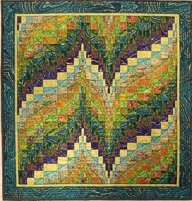 It was machine stitched and computer guided longarm quilted by Brigitte Gillespie. “The Magic of Skye” was made by Hanne Asbey from Aberdeen. Beautiful Scottish themed quilt in lovely colours, and beautifully quilted, – on a domestic machine no less. Another beauty combining foundation pieced pineapple blocks with an applique border. It is called “On Green Pond”, and was made by Judith Wilson. The quilt reminded me of some of the Egyptian Tentmakers’ quilts seen lately. This quilt, Liz Jones’ s “A Girl’s Best Friend” came second in the Traditional category. All the diamond shaped blocks have different applique motifs. Here is also applique. The quilt is called “Brightness”, and was made by Kazue Iwahashi from Osaka, Japan. This quilt by Gwenfai Rees Griffiths won third place in the traditional category. It is called “Cappuchino”, and has both hand applique and embroidery, in addition to lovely quilting. This quilt was made by Angie Taylor for a friend’s 30th wedding anniversary. Everything is in triples, including the three triple wedding rings. It also includes things the couple love, like cats and horses, and there are 30 pearls scattered across the quilt surface. I, for one, especially loved the poppies. Every now and then a quilt that does not capture your interest at first sight, turns out to be a gem at closer inspection. This one, made by Irene Harris and Susan Campbell from Australia, did not stand out when viewed at a distance. But up close, you got drawn in and in, – all the way “Beyond the Garden Wall”, which is also the title of the quilt. There were so many exquisite details to admire. I spent quite some time looking at this one. This one is called “Below the Surface”, and was made by Sue Roberts and Margaret Owen. The inspiration was early Victorian microscopic images of sea life. A fun and colourful quilt: “Bird Parade”, made by 6 quilters from The Netherlands. One motif made up of 6 smaller quilts, assembled by zippers. This one is utterly charming. “La Ville de Josselin” was made by 13 quilters from around this town in France. It was a gift to the town, and hangs in their tourist office. This quilt looks as if it has been made by one person, but there are in fact three makers. The quilt is called “Shared Abstractions”, and the group calls themselves “Two-Plus-One” The inspiration was what to do with leftovers. “Rural Prospects” above was made by Mary Palmer and Anne Kiely from Ireland. The quilt is a result of a collaboration between a textile print artist and a quilter. 16 quilters from “The Exe Valley Contemporary Quilt Group” put together this quilt called “Triassic Trio”. 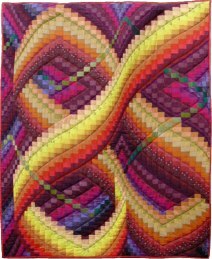 It was inspired by the varied geology in the south-west region where they live, and each quilter contributed a segment from one of the areas named in the top part. The quilt won a third in the Group category. And this is the Second prize winner in the Group category: “The Four Seasons” made by a 4 member group called “Cauldron”. It hung in a crowded spot, so it was difficult to get a straight shot. I did not get a detail shot of the top part, but luckily my husband had taken one. The quilts above are all from the Traditional, Two Person, or Group categories. I still have “a few” photos from the other categories to look through. The last one in this post is from the Pictorial category. The quilt is called “Snowing” and was made by Abeer Al-Khammash, from Riyadh. Perhaps one of the places where you do not expect a winter motif like this to be made. Turns out it was made from a calendar picture, and very well done, too. It received both a Highly Commended and a Judges Choice in the Pictorial category. Stay tuned, – more goodies will come soon. Again I’m sure there are some you photographed that I didn’t even see! I did see “snowing” though – that one is lovely! Yes, “Snowing” is beautiful. I still regret that there was not time to go back and have a closer look. Amazing work and all to be commended!